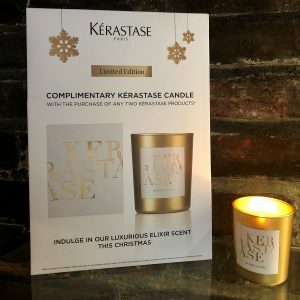 This Winter season we’re giving away a Limited Edition Kérastase Candle with the purchase of any two Kérastase products so it’s the perfect time to stock up! At this time of year, it’s best to be organised so book your hair and beauty appointments and stock up on your favourite Kerastase hair care products now so you can look forward to a little restorative indulgence to feel and look your best as party season arrives. Simply purchase two Kérastase products and receive this beautiful Christmas candle, divinely scented with Kérastase Elixir. The luxuriously gift boxed candle smells absolutely beautiful. Light the candle and carve a few moments out of a busy day to enjoy the heady scent and relax. The candle would also make a fabulous hostess gift if you can bear to give it away! For more details see our offers page. Please note that the offer cannot be used in conjunction with our Black Friday Kerastase Gift Boxes offer.